The Old City is an exploration game that's currently in-development for the PC. And pardon me for making such a crude comparison, but my brain looks at the architecture and processes this as being "Dishonored without all the bad guys". And that's pushing my buttons. 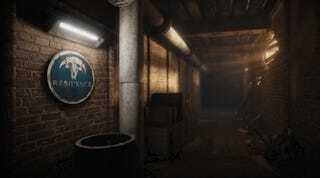 Set inside "a decaying city from a civilization long past", the initial stages of the game will play out like Gone Home, or Dear Esther, with the player simply walking around and exploring their surroundings. Later, though, The Old City will branch off, sending you down a particular pathway based on the choices you make (and meaning you'll get to replay the game to see how different choices affect the path you're sent down). I'm loving the setting; as mentioned repeatedly, it's similar to Arkane's bleak metropolis of Dunwall, complete with giant whales, yet with a rustic charm of its own. You can read more about the game - and its developers lofty goals - at The Old City's site.